This extension is a incremental search UI for online bookmarks, You can find bookmarks very quickly. 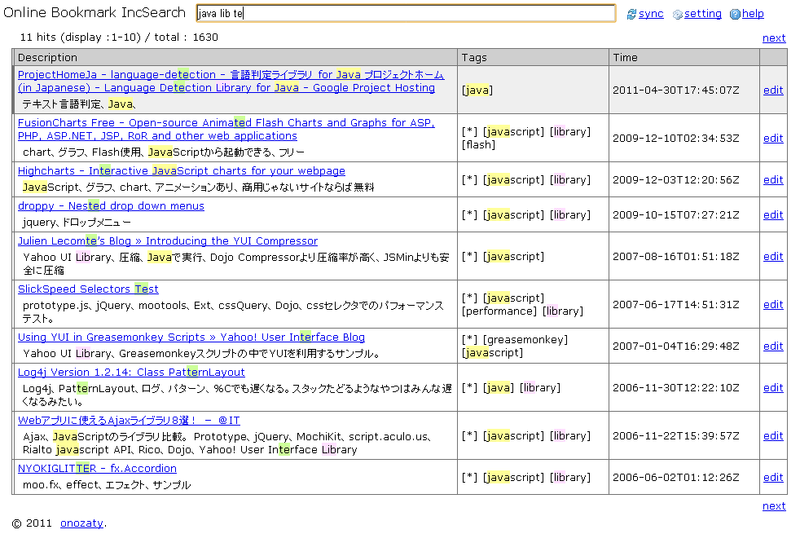 Incremental search from title, notes, tags for bookmarks. Match bookmarks show list and match keywords highlight. You can search of input multi keywords, Supported operators AND("keyword-a keyword-b"), OR("keyword-a|keyword-b"), NOT("!keyword"). Using keyboard shortcuts, You can find bookmarks very quickly. Bookmarks load from online bookmark service are stored in your local computer for quick loading later. Please install at the Google Chrome Web Store. After installation, added star inon on menu, this icon click to open the search screen. "setting" link from the following items to be set. Number of Results : 1 Page Display (default is 10). The one-page display is a small number of people are viewing speed is faster. Size of input area : Enter the text box the size of (the default is 80). Mac OS X's default is too wide and it is so, it may be necessary to adjust please. Bookmark selected, the display is a shortcut allows you, a matter of comfort. The list of shortcuts are as follows. Input text search pattern is as follows.